The world is over, but the con has just begun. Five years ago, a cataclysmic event obliterated everything within a fifty mile radius of the Los Spinoza Convention Center—right in the middle of Long Con, the world's biggest (and longest) pop culture convention. Underdog reporter Victor Lai barely escaped with his life, but his nerdy friend Dez Delaney—publicist for an indie darling comics publisher—wasn't so lucky. Dylan is an Eisner, Reuben, and Kim Yale-nominated cartoonist. She's the creator of graphic novels Bite Me!, Family Man, Outfoxed, and the forthcoming Queen of the Sea (Candlewick, 2019). She's a studio member of Helioscope in Portland, Oregon. EA Denich is a cartoonist and illustrator. She lives in Southern California. "With snappy writing from Dylan Meconis and Ben Coleman and gorgeously gritty (but fun!) 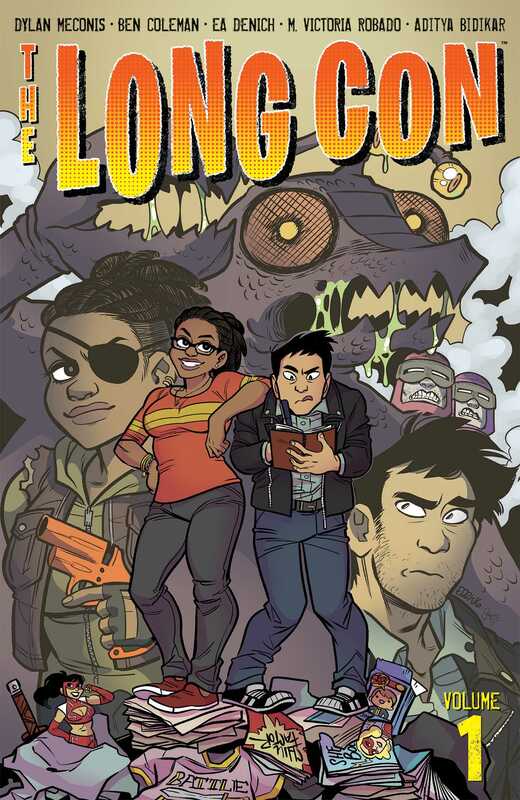 art from EA Denich, the first issue of The Long Con is a very promising lead in to what looks like is going to be hugely entertaining series!"